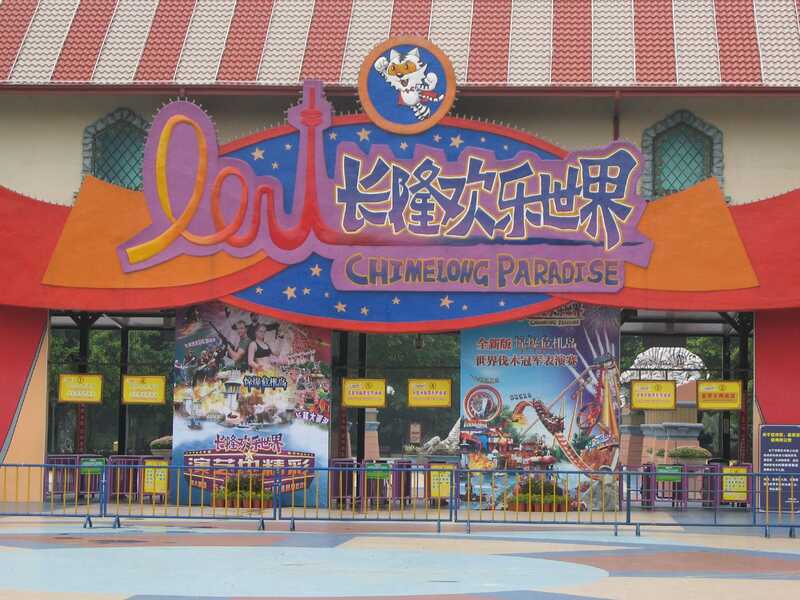 Chimelong Paradise is a large park located in Guangzhou in the southern part of China. It is currently home to six roller coasters, though they have already bought two more which will presumably be installed next year. The park is liberally sprinkled with fine examples of Chinglish, and some of it borders on the comical; our first coaster, for example, was labelled as brings you orgiastic scream. The ride in question was 10 Inversion Roller Coaster (#1277), a straight clone of the ride found at Thorpe Park. In common with its brother the most important feature of this ride is its ability to remove people from the queues of better coasters elsewhere in the park. Having said that, this version was at least rerideable, unlike the model found in England. Coaster number two was also a duplicate of a European installation. Motorbike Launch Coaster (#1278) follows the same track layout as the original at Toverland, and indeed might have been the same ride were it not for the different coloured track. As an aside, slightly unimaginative names were very much a feature of this park, but having said that they do at least convey to the uninitiated exactly what the rides in question do! The reader probably doesn't need me to explain what Dive Coaster (#1279) does. Its sixty metre first drop makes it the tallest roller coaster in China at present, though it will likely be eclipsed sooner or later as more and more amusement parks are built. The ride is a custom design for the park, but it is similar enough to be a clone of either of the two Busch Gardens rides in the United States, even down to the splash down area at ride end, where those who stand in the wrong place should be dabbled with water. It goes without saying that the ride was absolutely superb, as is a given for any new B&M product. The group voted to list it as the second best coaster of the trip, with Crystal Wings holding on to the top spot. The three remaining coasters were credits and little more. It was nice to finally ride a dry Half Pipe (#1280), though the experience wasn't something I needed to do more than once. Twister Coaster (#1281) was the second allegedly spinning coaster from Golden Horse that did nothing of the kind. Last but by no means least came the Family Gravity Coaster (#1282), which managed to raise only a few small bruises. Oppressive humidity sapped any enthusiasm I might have had for doing additional rides in the park. Instead, my group worked our way through four sit down shows; a reasonable if predictable magic show, the Marvin the Martian 4D show, the lumberjack show, and the action arena stunt show. The latter two were both excellent, and well up there with the best shows I've seen in any parks around the world.